Apples, like potatoes, will turn brown when cut and exposed to air. Tossing the cut apples with lemon juice or white wine inhibits the discoloration. Cortland and Golden Delicious apples do not discolor as quickly as other apple varieties. 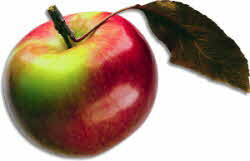 Keep apples cold - they lose flavor and crispness almost 10 times faster at room temperature. Apples absorb odors. They emit ethylene gas, which causes other fruit to ripen quicker. Store apples at 35 degrees F, 80% humidity to prevent dehydration. When cooking fresh apples for pies or sauces, the yield is about 50%. 1 cup sliced or chopped apples = 1 medium apple. 1 pound raw = 1/2 pound cooked. Use tart apples for apple pie. Apples, pears and potatoes dropped in cold, lightly salted water as they are peeled will retain their color. The many varieties of apples differ widely in appearance, flesh characteristics, seasonal availability, and suitability for different uses. For good eating as fresh fruit, the commonly available varieties are: Red Delicious, McIntosh, Granny Smith, Empire, and Golden Delicious. For making pies and applesauce, use tart or slightly acid varieties such as Gravenstein, Grimes Golden, Jonathan, and Newtown. For baking, the firmer fleshed varieties -- Rome Beauty, Northern Spy, Rhode Island Greening, Winesap, and York Imperial -- are widely used. Firm, crisp, well-colored apples. Flavor varies in apples, and depends on the stage of maturity at the time that the fruit is picked. Apples must be mature when picked to have a good flavor, texture, and storing ability. Immature apples lack color and are usually poor in flavor. They may have a shriveled appearance after being held in storage. Most apples are marketed by grade, and consumer packages show the variety, the grade, and the size. U.S. grades for apples are: U.S. Extra Fancy, U.S. Fancy, U.S. No. 1, and combinations of these grades. U.S. Utility is a less desirable grade. Apples from the far Western States are usually marketed under State grades which are similar to the U.S. grades. Avoid: Overripe apples (indicated by a yielding to slight pressure on the skin, and soft, mealy flesh) and apples affected by freeze (indicated by internal breakdown and bruised areas). Scald on apples (irregularly shaped tan or brown areas) may not seriously affect the taste.